I have a minor interest in vexillology – a cross over from my sailing career, where flags have played (and still play) an important role in communicating messages at sea. Flags can have real linguistic force. At sea, before the age of wireless telegraphy, flags were able to convey precise shades of meaning, which can have the force of lawful commands depending on who is flying them and under what circumstances. How is this related to the recent furor over the flying of the so-called “Confederate Flag” in parts of the United States? The history of this flag is indeed complex. As Civil War aficionados know, It never flew as the “national” flag of the CSA. In fact, it was rejected as such in 1861. Instead it was flown as a Navy Jack (1863-5) and as the battle Flag of the Armies of Tennessee and (more famously) Northern Virginia. 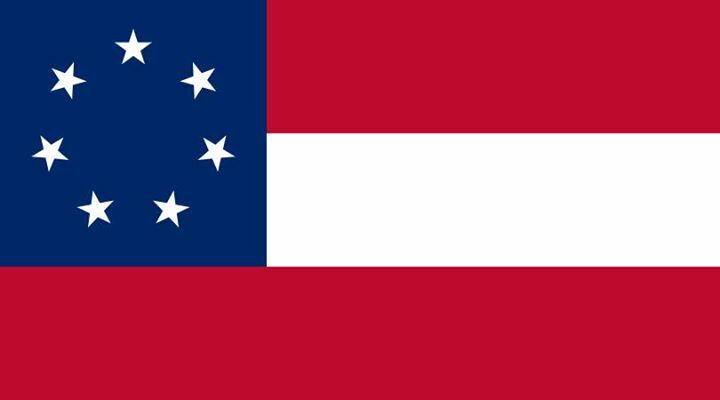 The so-called “stars and bars” is an altogether different flag (See below) which went through four distinct iterations as more states joined the CSA. The “Confederate Flag” only really came into vogue after WWII, and became (it is claimed) expressive of opposition to the Civil Rights movement in the South in the 1960s. I’m not so sure about that. People of my generation will recall how the Dukes of Hazard (TV series, 1979-85) drove around in a Dodge Charger embellished with this flag on the roof. I don’t seem to remember it ever causing any comment. For many, the flag was more of a vague signifier of outsiderness, about living on the fringes of the law. Nevertheless, this flag (it is also often claimed) is derived from the Scottish saltire, and (so the claim continues) is a reminder of the large number of Scottish settlers who populated the South in the pre- and post-Colonial period. But I have seen no hard evidence to support this claim. The “St. Andrews cross” is a pretty universal structural form to be found in flags which have no hereditary link either with Scotland or her patron saint. The “Confederate Flag” is never flown on state or federal buildings here in Missouri, but you will see it flying in southern parts of the state, in the Ozark region. It tends to be spotted in rural areas, flying over battered and dilapidated collections of shabby mobile homes in the woods, festooned with “Keep Out” notices, surrounded by half-salvaged pick-ups, and usually a lot of barking dogs. In other words, it tends to be an advert for (white) rural poverty, deprivation, and ill-focused anger. I guess in the thoughts of its flyers, the flag represents a kind of defiant rebel yell against “them” (government, cities, liberals, history, the better-off, the people on the other side of the road, who knows?). At any rate, the context in which it is flown rarely seems positive. But I could be wrong about that. But… the United States has (in my view as a foreigner) a deeply complex and embedded relationship with the “Other Flag,” and this is, I think, also in play, though in a rather oblique fashion, in the current furor. The national flag (Stars and Stripes) is, of course, ubiquitous in this country, in a way that I have seen in no other. Most of the larger lecture halls in my university display it. A number of my neighbors fly it on their front porches. It flies over shopping malls, outside churches, over used car-lots. Indoors and outdoors, you are never far from its presence. Eventually, you just cease to see it. But it is always there, flapping (as it were) at the periphery of your vision. Lots of countries have what is known as “Flag Etiquette” – formal or semi-formal rules about when and where you can fly the national flag. The flying of the British Union flag (the misnamed “Union Jack”) on public buildings, for example, is quite carefully regulated – the royal household was obeying that etiquette when no flag was flown over Buckingham Palace after the death of the Princess of Wales in 1997. The absence of that flag generated outrage in the UK tabloids, and hence the protocols were changed. Plenty of countries have flags which are banned or outlawed (the flag of the Third Reich in Germany, the ensign of the old Imperial Japanese Navy in Japan, and don’t lets even go near the many flags associated with the nations and histories of the countries associated with former Yugoslavia). But the United States has a whole raft of federal laws governing what you can (and, more importantly cannot) do with its national flag. These are to be found in Chapter One of Title Four of the US Code. Most of the prohibitions surrounding use or misuse of the Flag are, however, in conflict with the First Amendment, so that (so it would seem) many of the laws and rules governing flag use are themselves unconstitutional. Fly it upside down (except in cases of extreme distress); wear it; drape it; bunch it, have it on your ceiling; step on it; blow your nose into it; fly it on the left fender of your car; let it touch the ground; fly it in violent weather (on private property or when it is worn out or damaged); destroy it in an “undignified” manner; raise it in anything other than a brisk manner, or lower it in anything other than a slow fashion… and so on and so forth. Of course, almost all of these rules are ignored. The flags on the Moon, for example, left by the Apollo missions, are all in breach of the code (one fell down when the LEM blasted off, the others are “braced” – flags should hang freely – and they are allowed to fly unlawfully during the lunar night). But I, nevertheless saw furious arguments, on our university campus during the Ferguson protests, aimed at those students who had supposedly “disrespected” the flag (they flew it upside down and allowed it to trail on the ground). As a foreigner, it is (for me) purely a question of good manners to show some form of respect to the Stars and Stripes at certain ceremonial events (commencement ceremonies for example), though I learn that my behavior is actually regulated by the code. Nevertheless, at these events, I stand up and look vaguely respectful. But obviously no Pledge of Allegiance for me (though I was intrigued to learn that the original Pledge was written by a Christian Utopian Socialist and, of course, it didn’t originally contain the phrase “under God”). But I’m left with this rather confused set of responses to the whole US flag “Thing.” As a UK citizen I have an ambivalent relation to “my” own Flag. I saw it waved too often in violent demonstrations in the 1970s by racists and quasi-fascists. I know that for many of my friends in different parts of the (current) Union, the British flag has negative connotations. I feel vaguely stirred in France when I see the Tricolore hoisted above some tiny village mairie, thinking of 1789. But the US has invested its Flag with such layers of fabricated mysticism, such cumbersome rites of deference, such a plethora of contradictory meanings (liberty or empire? freedom or oppression?) that I am simply bewildered. Maybe an American can help me to understand this country’s (to my mind) unhealthy relationship to its Flag(s)? And the final paradox: by banning the flying of the Confederate Flag in public spaces (a move with which I actually agree) is that flag, nevertheless, not invested with even greater significance? 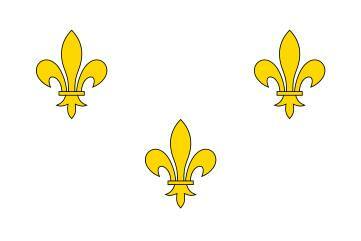 Nobody now flies the old Royalist flag of France (see below). It’s forgotten. It would be nice to simply forget the Confederate Flag, too. But I think that’s unlikely. The US lays too much store by its flags. Forgetting is not (yet) an option. Jonathan Sawday is a professor of English at Saint Louis University, he has written extensively on Renaissance literature.